I used some Ggh Kidsilk Mohair and Elsebeth Lavold’s Hempathy (the blue-green edging) and it’s wonderfully soft and drapey. It’s going in my Christmas gift box for now. This is the only way I can both blog and keep surprises. I’m also thinking about teaching this as a class, because the connecting part is a real mindboggle. But, I have some other projects under way too, so I’ll have to see what I have time for. 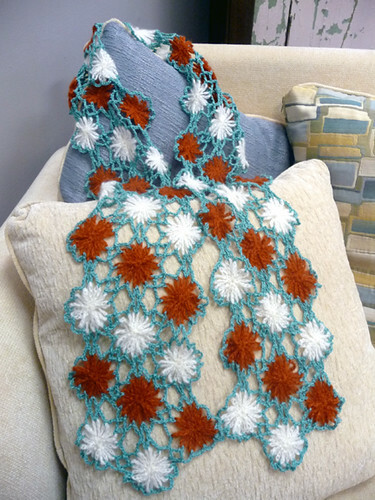 I have really enjoyed the last 2 crochet classes that I taught, hooray for that! I love the way the orange pops out of the blue. Well done!